Why you go at work? There are myriads of valid answers. Mine is because Computer Science is my passion and there is nothing better than working in something that you like. That profession allowed working in great companies. But even better was being able to learn for great professionals, some of them without telling me a word showed to me which was the next professional step to take. Doing a professional career is like drawing a painting, the final result will depend on the colors that you use or the experiences that you chose. The aim of this post is just basic introduction about how to use Argo framework for feeding your model classes from JSON data. Argo is a library that lets you extract models from JSON or similar structures in a way that’s concise, type-safe, and easy to extend. Using Argo, you won’t need to write validation code to ensure that incoming data is of the right type, or to make sure required data fields aren’t turning up empty. Argo uses Swift’s expressive type system to do that for you, and reports back explicit failure states in case it doesn’t find what you’ve told it to expect. Argo is the Greek word for swift and the name of the ship used by Jason, son of Aeson, of the Argonauts. Aeson is the JSON parsing library in Haskell that inspired Argo, much like Aeson inspired his son Jason. In the Podfile you will have to add two frameworks, Argo itself and Curry that is being used for saving effort on initializing structs and classes. In this section through different examples I will explain how to parse the most common JSON structures. Example 1. Most Basic JSON structure. As you can see with curry you save up call the initializer passing all class attributes. <| is for parsing a regular attribute and <|? for the optional ones. “person” is just the filename that contains the json. JSONFromFile is a helper method that retrieves the json from the file. At the end of the post you will find a like for downloading whole sample project. Example 4. Another way of parsing JSON file. As you can see the way of calling parser in that case is different but the result is exactly the same. For parsing classes I am based on the last struct example, but for clear understanding I will show an example. pet.year = (json <| "year").value! pet.name = (json <| "name").value! In deep the idea is quite close than with structures, but in case of classes is carried out in a different way. let json: AnyObject = JSONFromFile("pets")! I hope that throught all those examples you will not find any difficulty for understanting how to do a basic parsing. Please take a look at the library documentation for deeper understanding. You can download the sample project from here. I have added some color in the view components just for better clarification. Button – Bottom subview. For the following constraint do not forget select Top subview and Button. @IBOutlet weak var btnFoldButton: UIButton! @IBOutlet weak var cnsUpperViewHeight: NSLayoutConstraint! @IBOutlet weak var btnFoldButton: UIButton! @IBOutlet weak var cnsUpperViewHeight: NSLayoutConstraint! cnsUpperViewHeight to the Top view height constraint. What we do in the gesture recognizer is just calculate new value for cnsUpperViewHeight constraint, the hard work is performed by autolayout. Let’s make some make up, just adding some picture at the top subview and a map at the bottom view. Pan the button and you will see how top view is compressed, giving more room for bottom view. You can also download the sample project from gitHub. Cocoa control link to this control. MODEL-VIEW-ADAPTER DESSING PATTERN. 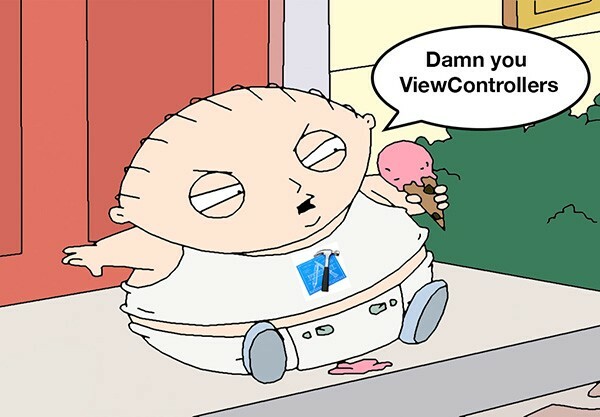 It is quite common in iOS programming that view controllers begin to grow and at the middle of development you discover that you have a view controller class with hundreds or even thousands of line. This is the common scenario where the view controller, apart from dealing with its controllers (uitableviews, uitableviews, hierarchy of views,…), has also to process data for being properly presented attend to notifications. The aim of this post is to explain an approach for breaking up view controllers into different design classes and provide them different responsibilities for practically leave the view controller with the responsibility of setup its view controller and filling its ui controllers when necessary. This approach is the most convenient case that the amount of information that you have to present in the view is quite reduced. This other is the most convenient when you have to deal with more than one dataSource in the same view controller, and also the origin of the data to show come from different sources (a data base, internet request, some costing data process,…). View. As always, show the content views. View Controller. In this approach, setup its uicontrols (tableviews, collection views, a view hierarchy, …) and attend its events. This is not something new, but what is new is that is responsible of being delegate of an Adaptor class and implement its delegated methods. Those delegated methods are basically informing view controller that there is new data to show in the view. ModelView. Is the model data to be shown in the view. Adaptor. Is the responsible for starting the processes for retrieving data and providing it to Model Data. Once there is some data to show is provided to viewcontroller via delegate. AsyncOperation1,…n. Are asynchronous operation for retrieving data from elsewhere. In the worst case scenario this action will take time. As you can see the View Controller get slimmer by moving part of the code that it performed in MVC approach to Adaptor and AsyncOperation classes. For proving you that concept you can take this sample project that implements what I have exposed. The aim of this post is to show how to build a Custom SWIFTed TableViewCell view cell. I have found several shallow examples with the default cell. But soon you will discover that will not fit a real sample project situation. I have found several difficulties from moving to Swift, that took me more time than I expected and that pushed me also to write this post. I have just created a new Single View Project Application in the default view controller and added a new NSObject class that extends from uitableviewcell. I have added a table view controller and a tableview cell with an image view and a label. @IBOutlet weak var tbvData: UITableView! I have mapped the tableview to tbvData, and added the minimum uitableview delegates. The table view is filled with 3 elements contained in two arrays (items and images). @IBOutlet weak var img: UIImageView! The aim of this post is just complement Singleton design pattern in a template post , but in Swift. Not that in Swift ‘dispatch_once’ is no longer necessary, as in Objective-C. Static constants in Swift, internally does it. So this is an issue that you do not have to worry about. This is how the pattern is used. As you can see Swift language structure facilitates a lot Singleton design pattern implementation. You can get the project source code used for writing this post here. Following previous post and observing in many projects how NSUserDefaults settings are handled I have decided to write this NSUserDefaults best practices. Easy, Is not it? The problem appears when there are many attributes deal with with the sets and gets scattered along the code and you want set break points for trapping when this attribute is being accessed. What I propose is to wrap this functionality in a single class that concentrates all the attributes that we want to get/set from the default storage system. The class is implemented as a singleton and for each attribute are overwritten set (and get) methods. In that way in a unique place the attribute is set (and get) into (from) the storage system. The access to the attribute is more clean and in a unique class file we have all the system storage functionality concentrated. You can download the project used for writing this post here. The aim of this post is just explain in a simplified way how to trap when a class property is set/get. The most typical scenario where this mechanism is used is when you have to do some calculations before returning a property value (in case or get) or when you have some tasks when is being set a new property value (in case of set). This mechanism is also very useful when somethings does not go as you expect with an attribute. You can find the sample project that I have use for writing this post here. The aim of this post is to explain and provide an example about notification mechanism simplified (,but not simplistic) in swift. The first thing that you need to be clear is when to use this mechanism and when delegate mechanism. Both mechanism help to decouple view controllers. Notifications offer the advantage that multiple objects can observer one notifications. In delegate mechanism the communication is direct (through a protocol method implementation) with the delegate class. The example that I am going to present to shows the notification mechanism as a broadcast service. A timer periodically will launch a notification, on the other side there will be two classes (Alice and Bob) that will be intercepting the message. Is important to keep under control when to unsubscribe to the notification mechanism. In case of Alice is after receiving 3 messages and in case of Bob is when the class is removed from memory. You can find the sample project here. The aim of this post is to show how it works Key-Value Observing mechanism (KVO). KVO is a mechanism for transparently notifying observers of changes in object properties. In other words, this mechanism will allow us to trap when some object property value is being modified. When you will run the project you will see that the above function is called twice. Once during NewObject initialisation and the other during viewDidAppear. The aim of this post is to present Singleton design pattern in a template. I have seen some post and articles that showed the implementation key points separately, so this is why I have decided to write a mini-post showing an implementation template and its usage. I have added a local attribute (iLocalAttribute), for showing how to handle them, at the beginning I had to create them as static and for having access to them I had also to create static methods, but in a few lines I will explain how to avoid that. Declare a static variable to hold the instance of the class, ensuring it’s always available, but inside of sharedInstance method context. dispatch_once_t which ensures that the initialization code executes only once. Finally return the instance class. Finally I have created a simple function that updates the local attribute and returns its value. As you can see neither the attribute nor the method are static.